Tamara Dees searches for the relation between silence and size of impact, the relation between a man and a ship. How big is a ship in relation to a person, to a house? Can we ignore something big? It is not about being fascinated by boats, in fact it has nothing to do with the boat as we know it. It is about how to experience, research, how to be small in a big world. Freeze a moment to realize where you stand and who you are. For her, traveling over water is a metaphor for the development of a human being, in search of his identity. She makes installations, photographs, drawings and video, depending on the situation. Work has been purchased by the Collection Sanders -Ten Holte, Woongoed, Kunstuitleen Vlissingen (Flushing Art Library) and private collections. 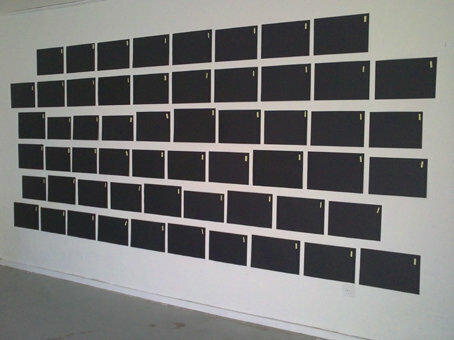 For temporary exhibitions in public spaces work was commissioned by the Province of Limburg and CBKZeeland. My paintings arise from the possibilities and characteristics of acrylic paint. They are open and transparent paintings, they refer to landscapes. Occasionally I put figures in these landscapes. But much more I look for alternatives to show something about the time that we live in. That’s how I got the idea for stickers on my work. They look like they have just spontaneously been stuck on the painting, but they are very carefully painted in place. This creates an exciting contrast between two very different views. Stickers fascinate me, it amazes me to see what can be found on the streets, stickers often fit with current events. But it is also interesting what kind of stickers are made in the course of time. I grew up with the development of the sticker, a painting like ‘Forever Young’ plays with this. Next to ‘Forever Young’ I will show the work ‘Iran’. These two works complement each other. The stickers are in fact small paintings on the painting itself. 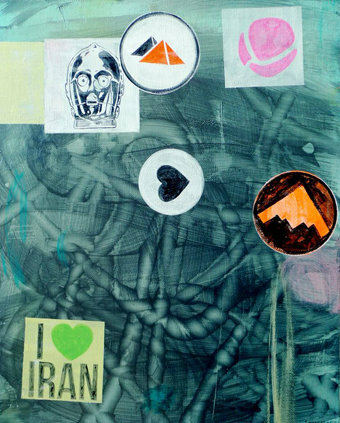 On ‘Iran’ the stickers are more suggestive, as characters. There is more clearance between form and content, allowing the viewer to associate freely with it. But I am also referring to science fiction and politics. Both works show the capabilities of the paint well, what is and especially how it is there. 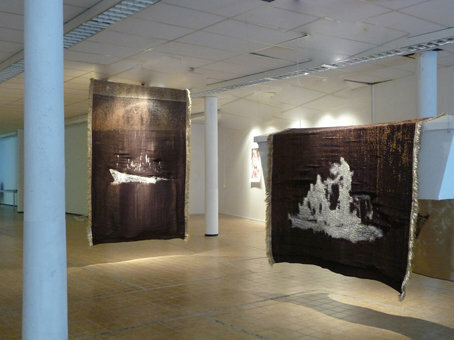 Anke Land designs tapestries and makes drawings, displaying human beings. Anke Land picks them from the media and records them in tapestries. Scenes in which people manifest their desire for transparency and change abundantly, yet at the same time wish to remain uncompromisingly hidden. She transforms these contradictions into archetypical images, in which people move collectively behind masks and façades. Anke Land weaves in accordance with traditional craftsmanship, but with the abstraction of modern representation. Through her drawings Anke Land closely follows the topicalities. They are much like notes in a diary, recorded with pencil or paintbrush, ink and water, on clear foil. Continuously recurring in her oeuvre, much like a logo, is the skull. It’s her metaphor for the passing, and therefore the preciousness of life. Johan Nieuwenhuize (photographer, artist and curator)shows his project IMG. It’s a growing collection of abstract and semi-abstract photographic observations of »the city«: structures, buildings, cars, and reflections. The work represents an active visual archive consisting of images made during Nieuwenhuize’s travels to different cities in Europe and the USA. The way the images are combined, is based on the »Kuleshov effect«, demonstrated by Russian filmmaker Lev Kuleshov in the 1920s. In his short film a portrait shot of a man is alternated with shots of 1. a bowl of soup, 2. a dead child in a coffin, and 3. a woman on a divan. In each context the expressionless face of the man is interpreted differently by the viewer: hunger, sadness, lust. to shift the meaning of individual images, alter the context and let the viewer associate freely, to form new meanings. Pier Pennings shows the ephemerality of nature and man: in his pictures of soil structures, patterns of trees and branches, empty rooms in deserted buildings, or scale models of city-like buildings. 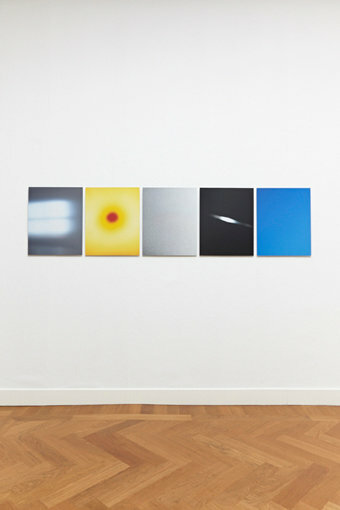 Visual reality in its most concrete form is therefore always present in Pier Pennings’ work. Everything is tangible and earthy. Balancing between desolation and intimacy, the image acquires an indefinable value. There is a tension between two extremes: the definable and the indeterminable. 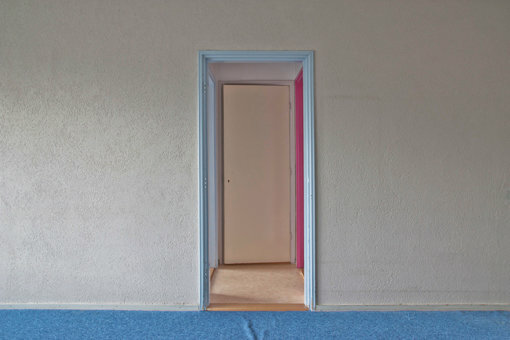 His most recent work is the extended series “Home it was”, pictures he makes in empty houses, shortly before they are demolished. They are mostly built in the early fifties and sixties, at the end of the reconstruction of the Netherlands after the second world war. It’s wondrous how strong the people’s soul sticks to their houses, specially when they are gone. Pier Pennings is always searching for the emotion of the passing, hidden behind the so called reality of what we consider to be objective and constant. He uses the definable to show what never will be determined: the question behind the question, not the answer. Since oktober 2014 Brieke Drost and Ronald de Ceuster are working on a project called; ‘Trashure’. At first sight their personal work is completely different; B r i e k e D r o s t paints precious objects in a carefully researching way, a n d R o n a l d de C e u s t e r is a site specific sculptor. On their website www.trashure.nl they react on each other by sending images of their interest. By exchanging these pictures they work on an inspiring archive. 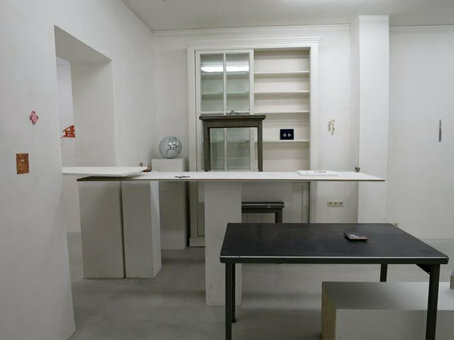 Next to this website they show their work in art spaces as a so called ‘Gesamtkunstwerk’.